Making Your Remote Office Work! 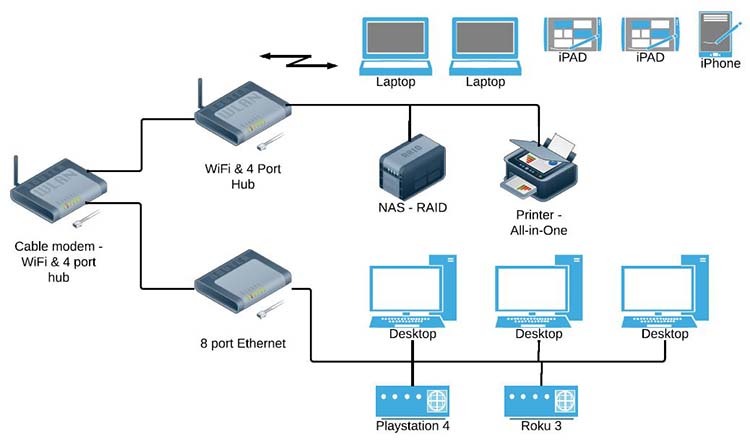 If you are running your home business or remote office with a laptop and Internet connection you have a simple home office network. As you add more pieces to your network it will become more complicated and you will find this article helpful to keep things running smoothly. The above diagram is my home office network. This includes my remote office, family computers and entertainment devices: PlayStation 4 and Roku 3. Usually you will have one Internet connection for your home or remote office and everything goes uses this connection. The first thing to consider is the Internet connection to your remote or home office network. This is your connectivity to the outside world. The faster the better, but it will cost more. You need to decide how fast is fast enough. If you have kids that like online gaming, you will also want to consider network lag. This is also called ping rate or response time. The faster the response rate or lower ping rate the better the gaming experience. Network connection speed – and the ability to upgrade to a faster connection. Personal recommendation – talk to your neighbors and see who they are using and what they think about the speed and service. Someone on the other side of town may have a better or worse experience and best to ask someone close to your home. Purpose – what are you using the Internet connection for? Emails and Surfing – you can get a slower connection. Surfing, Voice over IP, Netflix – you will want a faster connection. Gaming where losing isn't an option – you will want a really faster connection with low latency. What modem or router do you get and is it included in your monthly Internet access fee? Based on the Internet access provider, you may not have a choice of which modem use with their service. In this case it is a good idea to review what they provide before you sign up. My cable modem has WiFi and 4 Ethernet ports. This is a fairly common configuration. The other thing to consider is the cost of the cable modem or DSL modem? Is it included in your monthly fee? Is there a monthly charge? Can you purchase it? Years ago I purchased the modem and saved myself $5 a month. Which was worth it. With my latest plan they include the modem in my monthly fee. How much do I need to spend to get the fastest Internet connection speed? Do I need the fastest connection speed? My Internet access provider has several speeds available. And the faster connection speed, the more monthly data is included. If you are not sure of what you need and you can upgrade for free, start with a lower speed and monitor your usage. Then upgrade if you are getting close to your monthly maximum. Just make sure you don't get overage fees. Last year when I upgraded my cable modem and home office network connection speed, I ran an Internet connection test to determine the speed. Then I recorded the results for future reference. This gives you a base point and helpful in the future to speeds it if looks like the network is getting slower. It's always good to use the same tool to test the network speed. I like to use speedtest.net. Below you will find a few results from using this online tool. I like to connect desktop computers using a wired Ethernet cable. I've worked with wireless data for many years, but I still like using a wired cable when I can. I like to connect laptop computers to a wireless network. If use it at my desk a lot, I will also have an Ethernet connection available. If it is really hard to run a Ethernet cable to a location, I will use a WiFi network. My downstairs has a false ceiling and it's really easy to run cables to our offices. Upstairs is bit more difficult. I use to connect printers directly to a computer using a printer cable. Every computer in the house had it's own printer. Last year I purchased a printer with a WiFi connection. It was easy to setup and everyone uses it now. If you are curious, here's an article I recently wrote on purchasing my Epson WF-2650 printer. The location of the WiFi router is important for the best coverage and speed. It's best to have it in a central location. This will give you wireless coverage throughout your house. Unless your house is really big. Then you may need multiple WiFi routers. Or connect some of your network devices using wired Ethernet cables. Looking to stay safe online? Here's a good article from Stay Safe Online on steps to secure your home network. I built my home office network up over time. At the start I had two desktops and a cable modem. As you can see from my network diagram I have a lot more stuff now. As you add devices to your network it is a good idea to draw or map things out. This gives you a good idea of how everything is connected and what equipment you have. It's also a good idea to understand what you want to use your home or remote office network for? Is this your primary work location or will you mostly work in an office? If you are only occasionally working from home you will not need to have as fast as a connection. It's nice, but maybe not necessary. Good luck setting up your home office network and please leave a comment below if you have any questions for additional tips you want to share.